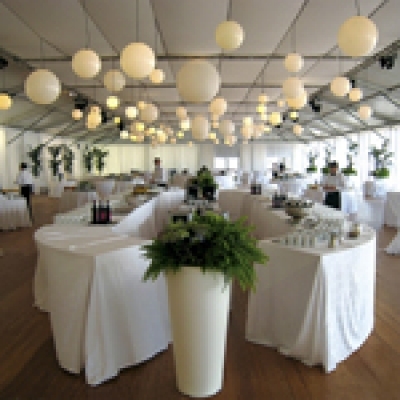 Eurotend marquees allow to create cosy and practical indoor spaces. The sturdy supporting structure made of anodised aluminium is fixed to the ground by means of steel nails of variable dimensions. However, if the ground does not allow them to be used, anchoring can be ensured by ballasts or chemical anchors. Structure stability is ensured even further by a steel bracing system. A special mould- and dirt-resistant, class 2 fireproof PVC tarpaulin is used as a roof and sidewall. Coatings in white PVC or, on demand, in coloured, opaque or transparent PVC are always in perfect state thanks to particular washing processes performed before each new installation. The particular sturdiness and reliability of the materials used result in long-lasting tents that are easy to transport, erect and dismantle. Eurotend marquees guarantee high-quality and high-tech covered areas that can meet the needs of the most demanding customers in a short time. Double-pitch marquees are versatile and modular and come in different dimensions. Span width ranges from a minimum of 10 m to a maximum of 60 m. Length is generally calculated based on the display area available and it can be any value in 5-metre modules. Side height can be 3, 4 or 5 metres. However, different heights can be arranged on demand. Eurotend indoor marquees are perfectly suitable for fairs, exhibitions, sporting events, meetings, fashion shows, parties and private celebrations, warehousing, logistic solutions, workstations and production areas.